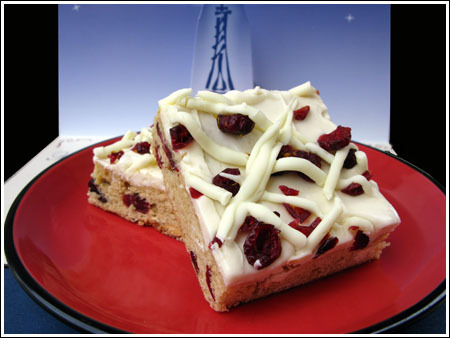 Cranberry Bliss Bars were all the rage a few years ago, and everyone was trying to clone them at home. The ones served at Starbucks were hit or miss — sometimes they’d be fresh, and sometimes they’d be dry. This is one of the clone recipes so you can make your own, guaranteed-fresh, Cranberry Bliss Bars. I’m not sure who came up with this recipe. It’s not identical to Starbucks and is a bit cakier than theirs, but it’s still pretty good. It calls for orange extract, but I used vanilla. An almost identical recipe was posted on Recipezaar so you can read those reviews too. Update: Since posting, I’ve changed the frosting a bit by adding a little more cream cheese and less sugar. Also, I don’t recommend using a 9×13 inch pan otherwise the bars come out too thick and cakey. It’s important to stick with the 15×10 inch pan. Preheat the oven to 350 degrees. Line a 15x10 inch metal pan with parchment paper or Release foil. Beat the butter and sugar until creamy; add eggs and extract (I used vanilla) and beat until combined. Add the flour, baking powder, and ginger and stir until mixed, then add the cranberries and chips, stirring just to blend and being careful not to over-mix. Spread batter in prepared pan and bake 350 for 23-24 minutes or until the edges are light brown and a skewer inserted into the center comes out mostly clean. Let it cool completely. Frosting: Beat cream cheese and butter until fluffy. Add extract and confectioner’s sugar and beat until frosting is fluffy and spreadable. Spread evenly over cooled bars. Garnish: Use a zester to remove rind from an orange. Chop 1/3 cup Craisins coarsely. Sprinkle this garnish of orange zest and Craisins over frosted bars. For the final topping, mix white chocolate and oil in a glass measuring cup. Microwave 50% power for 1 minute; stir. Repeat 1 more minute at 50% power; stir. Use a fork to drizzle the white chocolate in thin diagonal strips across the bars (I didn’t use fork). This recipe is adapted from on one Recipezaar. ** I used unsalted butter and didn’t add any extra salt. The bars were still okay, but I think they would have been better if I’d added a pinch of salt. These are DEADLY DELICIOUS! I made one tiny alteration and that was I used chocolate molding/melting wafers instead of trying to melt the white chips. The wafers melt at a lower temperature and stay smooth and creamy for drizzling. Thank you for sharing this recipe. I made a test run of these for Christmas cookie trays yesterday. I really liked them (especially more so refridgerated – seemed less cakey), but not sure if they made the cookie tray “cut.” I am afraid that they would not hold up that well. Regardless, I would make them again as a special treat. oh – and I used vanilla extract as well, but added orange zest to both the dough and the frosting and I loved the orange/ginger combo it gave the bars, so I would suggest doing that. As promised, here is my take on these scrumptious bars. I made this initially with the cake mix but prefer using the cookie dough recipe – it’s easier and more like a bar crust, not cake-like. You can, of course, make these with regular dried cranberries but I like to be different. Enjoy! Preheat oven to 350°. Line a 9”x13” pan with foil and spray with non-stick spray. In mixing bowl, fold cranberries into dry cake mix. Add eggs, oil, zest and orange juice and mix to blend. Pat dough evenly into pan. Bake for 20-25 minutes. Cool on a rack until bar layer reaches room temperature. Prepare a store-bought sugar cookie mix (I used Betty Crocker), adding 1 cup dried, orange-cranberries, the zest of 1 orange and 1/4 cup orange juice plus the egg and butter called for on the package. Mix together well and pat evenly into 9”x13” pan which has been lined with foil and sprayed with non-stick spray. Bake at 350° for 20 minutes or until lightly browned. Cool on a rack until bar layer reaches room temperature. Mix together cream cheese, butter, zest and 2 T. orange juice until well blended. Add powdered sugar, using enough until you get the consistency of thick frosting. If it’s too thick, add more orange juice. Frost bars. Sprinkle chopped cranberries over the bars. Put melted white chips into zip bag, snip tip and drizzle chocolate over bars. Cover with foil. Let set up overnight. Cut into 32 squares. The other version is made with all brown sugar and has crystallized dinger. I think it may be close than this one, but I’ll have to test it to be sure. Anne, I can’t wait to see your knock-off! I won’t be able to make it until next week, but I will definitely try your version too. I love them too…they come out during the xmas holiday. I just bought a box of 8 yesterday…They are called Cranberry Bliss and you can get them individual or a whole box for a little cheaper. They are YUMMY!! !I hope you could clone them b/c every year I spend so much money on them. I buy at least a box (8) every week. I’ve never had these, but whether they taste like Starbucks or not, they sure look good! Funny, as often as I visit Starbucks, I don’t ever buy any of their baked goods, though they look good. It would be fun to try and clone some of their recipes. Did you ever try the chocolate cinnamon bread? It was good.